My husband once told me that I dye my hair as often as I change my shirt. His observation is almost accurate. I do dye my hair a lot. I'm actually forced to. I have to cover my ever increasing stubborn grays! Having gray strands is not all that bad as I discussed in my previous post; but still, I'm not prepared to go salt and pepper. If you're a habitual hair "dyer" like me, then you know how harsh those chemicals can be to your glorious crown. Ammonia in hair dyes can cause a lot of unfortunate side effects; from allergies to damaging the immune system. All in name of vanity, huh? There's a better way to dye! I found a new DIY hair dye that I'm itching to try. Olia by Garnier is ammonia-free but still gives 100% gray coverage! Sounds good! 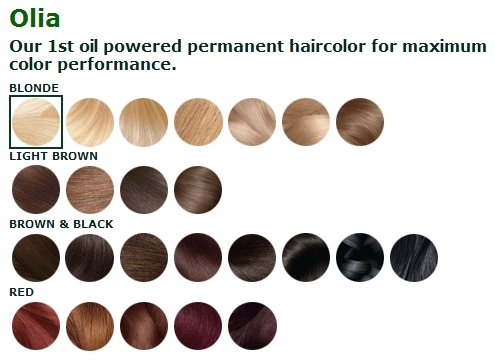 Garnier claims that it's oil-powered hair color will improve and restore color-treated hair's natural glory. Ok, I need that. Olia apparently contains 60% oil blend to make hair softer and reverse roughness and dryness. I'm sold! I'll give you an update once I get my hands on one. Olia is available at Target for $ 8.99.